Overnight lift at Haymarket Station. Projects from across Scotland’s infrastructure spectrum have been recognised in this year’s Saltire Awards for Civil Engineering. Flood defences, rail improvements, hydro-electric, renewable energy, harbour works and seawall protection are some of the projects highlighted, with the main award going to Edinburgh’s new-look Haymarket Station. Scotland’s fourth busiest rail station was announced the over-all winner following a project to accommodate a predicted six million increase in passenger numbers over the next 15 years. The £25m redevelopment included refurbishment of the A-listed station building and a major extension. 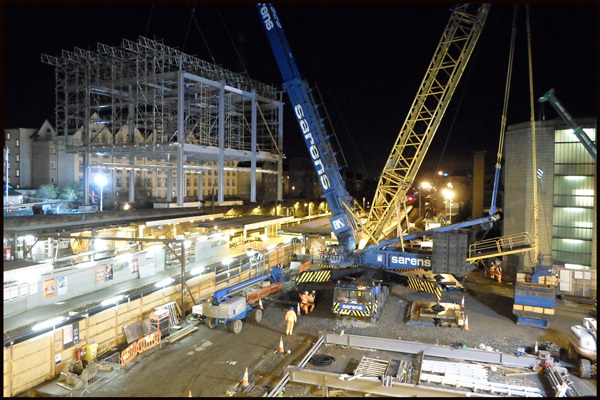 The new concourse building, which bridges the platforms and rail lines, was constructed in a former car park adjacent to the station and saw two 110-tonne modules lifted into place during the night. That approach allowed completion to be brought forward by nearly a year with all work undertaken while the station was fully operational. Contractor was Morgan Sindall. An increase in traffic and the introduction of a bigger vessel drove this project. The initial design of a cross-tied combi wall was abandoned when it became clear that up to 40% of all ferry sailings could be lost during construction of the pier extension. 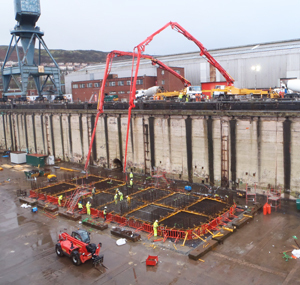 The ingenious response was offsite construction of a concrete caisson in Greenock which was then towed to Ullapool and sunk into position on the prepared sea bed. The longest new domestic rail line to be built in the UK for over 100 years reconnects the Borders to the national network. It has seven new stations, 61km of track and capacity for further dualling and electrification has been built in. Some 95 bridges were regenerated along with two tunnels and 42 new structures were installed. 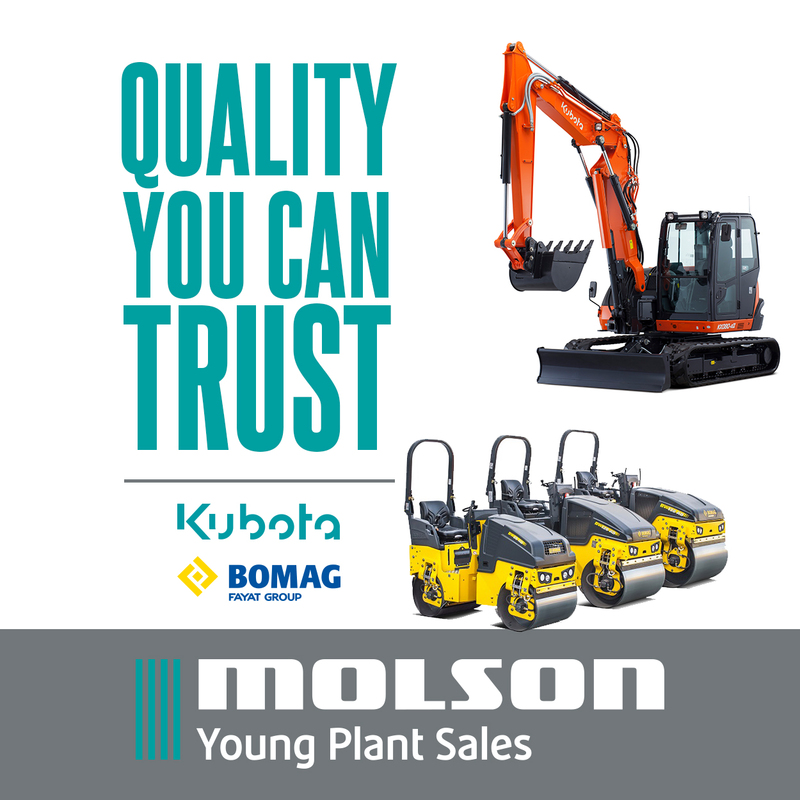 Hampden Park Redevelopment Contractor: WH Malcolm Ltd. 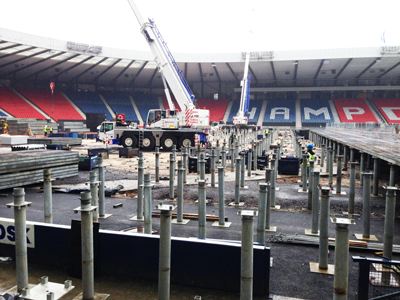 The temporary transformation of Scotland’s national stadium to host track and field and the Glasgow 2014 Commonwealth Games closing ceremony was achieved by raising the playing surface by almost two metres. 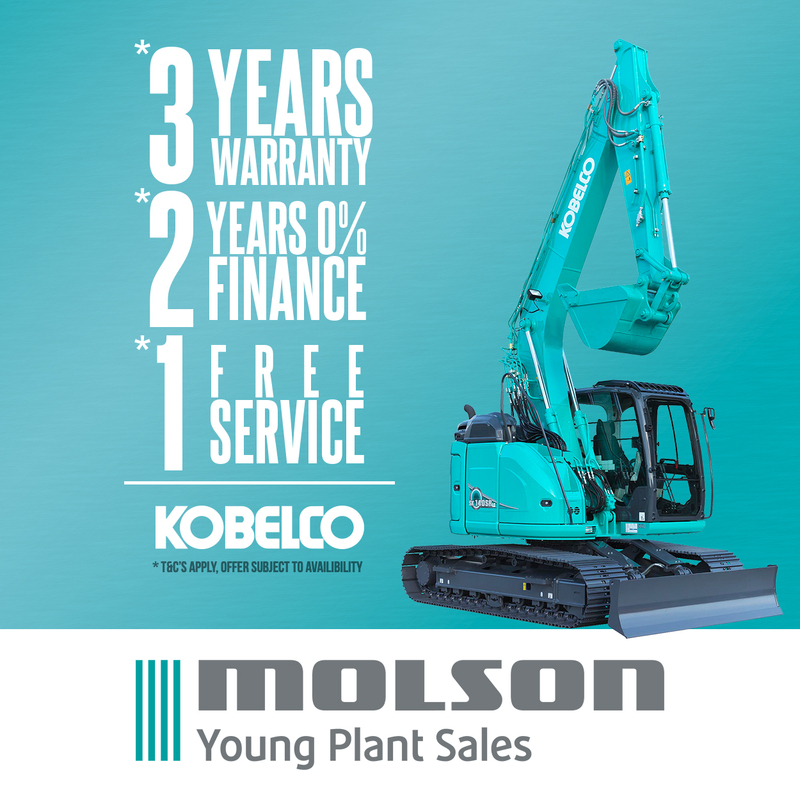 Engineers pioneered a raised deck system made up of 1,200 base panels supported by over 6,000 structural steel posts and weighing over 1,000 tonnes. River Ness Flood Alleviation Contractors: Coffey Group, Morgan Sindall, McLaughlin & Harvey Construction. The scheme provides flood protection to more than 1,000 properties and the primary defence is a number of reinforced concrete retaining walls with much of the hard engineering hidden under the new streetscape with mature trees and river banks retained to maintain the natural look of the area. The annual awards from the Saltire Society and the Institution of Civil Engineers Scotland recognise excellence and innovation in civil engineering. 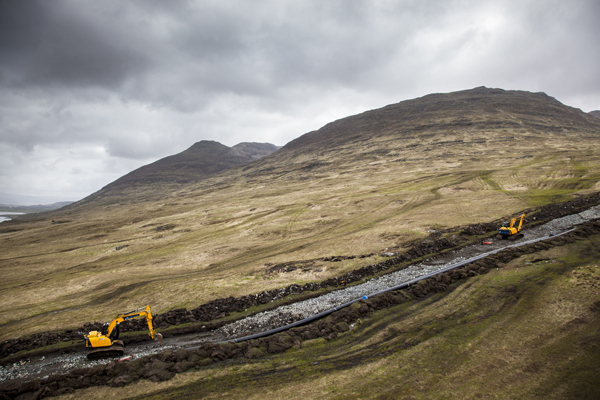 The loneliness of the long-distance plant operator…1 TSL Contractors on the Ben More Hydro Scheme. 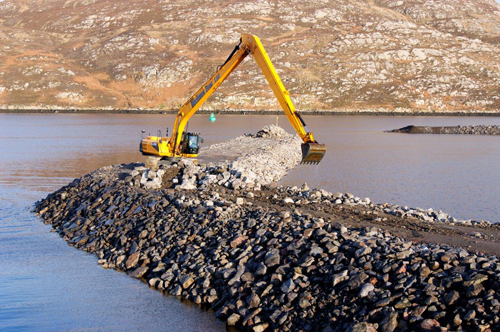 The loneliness of the long-distance plant operator…2 MacInnes Bros. at Lochboisdale Harbour. 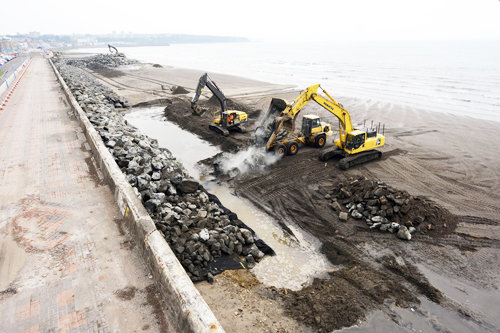 Placing rock armour at Kirkcaldy seawall. 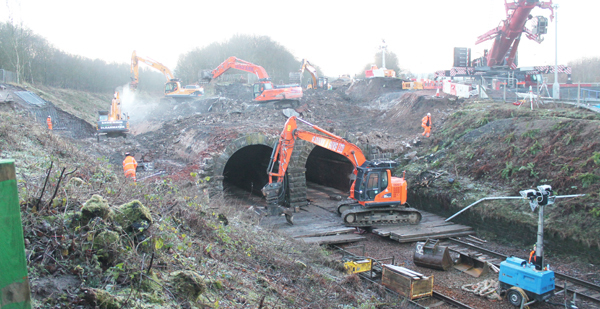 It’s all go at Carmuirs Aqueduct. 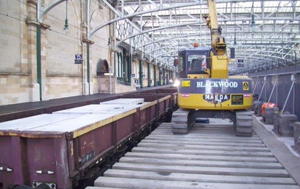 Blackwood Plant on hire at Glasgow Central Station. 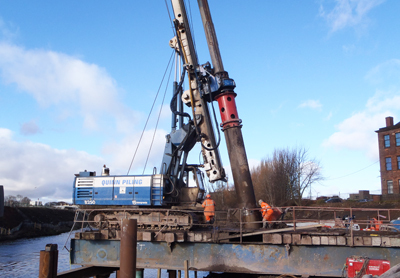 Quinn Piling rig at Shawfield Dalmarnock.